The phrase for the area was coined by Joseph A Citro, an author, in 1992 when a radio broadcast discussed the area in Southwestern Virginia in which people had gone missing. A number of people went missing between 1920-1950 and has similar characteristics to the ‘Bridgewater Triangle’ in nearby state Massachusetts. 12th November 1945 – 74 year old Middie Rivers disappeared. He was with four hunters and got ahead of them but he never showed up again or met with the other four. It was a local area that he was familiar with so it felt as though there was little to suggest he had got lost. 1st December 1946 – 18 year old Paula Weldon disappeared, she went out for a hike. She was seen by a couple and they say she was 100 yards ahead, she went around the corner and they too walked that way but when they got around the corner they found no sign of Paula. She never showed up, nor any trace, despite a $5000 reward and the FBI’s involvement. 1st December 1949 – James Tedford a veteran went missing three years to the day later. He had been visiting relatives and was returning home on the bus to Bennington Soldier’s Home when he went missing. He was according to witnesses, on the last stop before his destination. His belongings were still in the luggage rack, the open bus timetable was on the seat and he was nowhere to be found. 12th October 1950 – 8 year old Paul Jepson was with his mother in a truck. She left her son in the truck to go feed the pigs, she was gone for about an hour. When she got back he was gone, search parties were formed and with Paul in a bright red jacket he should have been easy to spot. 28th October 1950 – 53 year old Frieda Langer and her cousin Herbert Elsner left the family campsite to hike. She slipped and fell into a stream and said she would go back to change her clothes if he could wait there. When she did not return he went back to the camp and was told that she had not been back there, and for the next two weeks search parties extensively combed the area. 12th May 1951 her body showed up in a spot that had been searched very well at the time, there was no chance for it to have been there at the time. Unfortunately due to the time lapse a cause of death could not be determined. A quick analysis of these and I would conclude that given today’s forensics there might well have been clues, also there have probably been other missing people cases locally over the years but they had been singled out as a phenomena suddenly making them extra-ordinary as a collective. Paul Jepson may not have vanished, he may well have been kidnapped, for instance if he had been taken away and the abductor was gone by the time the alert was raised that would mean he was another victim of child abduction and not so much a paranormal/mystery event. Frieda Langer’s mystery might also have a more mundane and grizzly explanation. Abducted and killed away from the scene with the speculation high and searches constantly going on, there is a chance that the killer waited and kept the body concealed until the hype died down enough to dump it back there. However given the the disappearances seem to have stopped after a spate that went up until the 1950’s, one may have to wonder why. The Ridges is located in Athens, Odio and was also know as the Athens Mental Health Center. It was there for the criminally insane and opened it’s doors 9th January 1874. It was brought by the State and Federal Government from the Coates family; it was over 1000 acres of farmland. The main structure was built to resemble a home which was unusual when most of the asylums were effectively a house of abuse and torture with their given conditions. It was built on the familiar plans of the Kirkbride design. According to Wikipedia one of the leading causes of male insanity in 1876 was masturbation! Concerned yet? During the first three years of the hospital being open fifty six men and one women were diagnosed with this problem. The Ridges was one that did not use bleeding, freezing and head kicks to try and shock their illness away, the more violent patients were kept away from others and until the 1900’s did not suffer too much from overcrowding. The decline of treatment however went alongside the overcrowding and without this came the fall back into the old ways. The Ridges reverted back to a place that used shock therapy, lobotomy and physical abuse to control its patients. By 1993 the Ridges had becoming a place to shut it’s doors for good and all the patients left, well apart from one of them. Margaret Schilling went missing 1st December 1978 and 12th January 1979 her body was found in the abandoned top floor ward N 20. The ward had been closed down for some time and despite a check of the hospital they had not thought to go into that area. The official cause of death was heart failure, she was found by a maintenance man who found her cold, lifeless and unclothed several weeks later. Apparently you can still see a stain in the shape of a human figure, on the spot she died. It is also said that she is seen peering from the room and that voices have been heard, lights are seen and shadows, and more eerily the noise of squeaking gurneys. A note on the body mark, I found some information whilst surfing to say that there was indeed some thought placed into the strange body shaped mark that is most definitely present. So they decided to try and work out what the mark was by determining if there were any traces of old fat deposits, owing to the lack of anything else on the site. The site is now owned and used for OU, however the portion where the mark is has not been opened for use or to the public. It had not been chemically tested or explained, perhaps better left to myth rather than fact however they decided that this could be of forensic use to try. The Body Farm in Tennessee has been a useful earmark in the continuous investigations about how the body deteriorates after death and the conditions under which these things change speed. Most bodies are found at the scene and have some evidence about their origin; this was a chance to try another study about remains and their effects. Samples were collected from the light stain area, the dark area around it and the concrete in the room as a control test. They collected samples from soap, a small piece of skin from a volunteer and a cleaner called Franklin Blu-Lite which had been used on the stain. So what did the tests show? The samples from the light area showed the human stain was produced by a degradation of a skin or fatty tissue and chemicals from the cleaner. So what they can establish is there was a body on the floor, so most likely Schilling’s retrieved corpse. 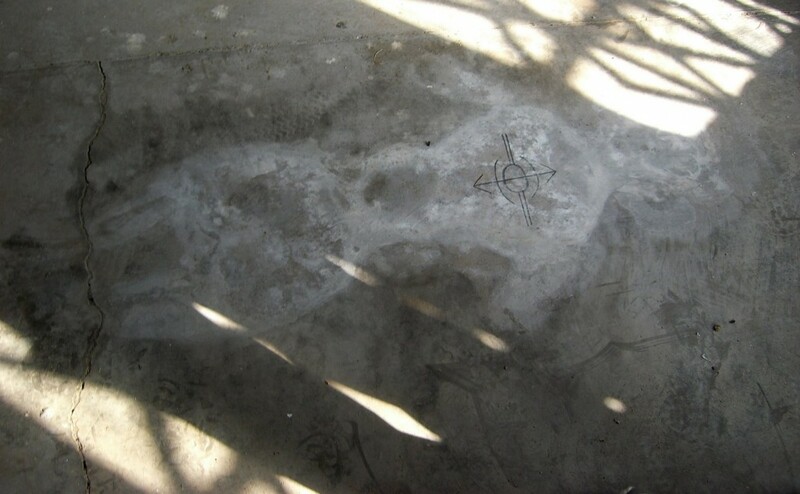 What it can’t seem to explain however is the shape it is in, if a mop or scrub has been used to clean up after the body was moved it’s been cleaned in a strange manner of following just the body shape itself, as a more general clean of the area would have left an irregular set of marks. So that’s the mystery I took from this one, less so than the rumoured haunting.